Your gallery has been delivered. Now you are trying to decide how to display your beautiful portraits. Sizes, dimensions, combinations, layouts… It is all a bit overwhelming. 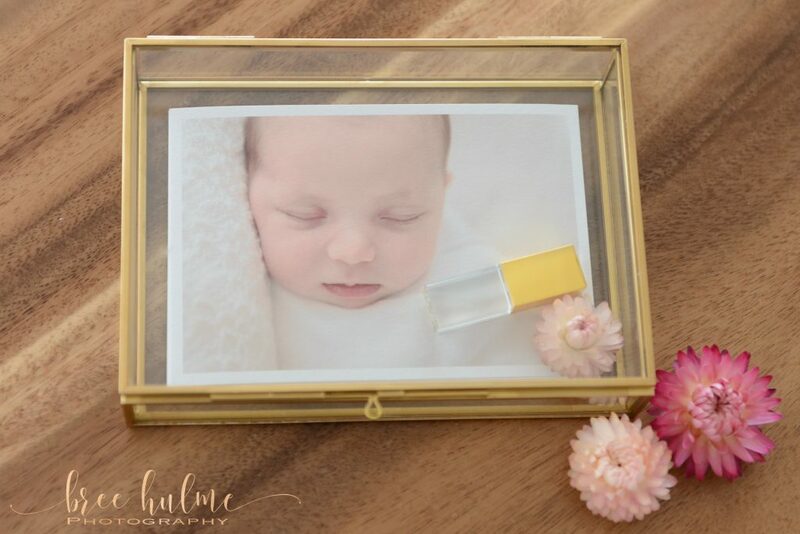 I have put together a few of our favourite, and also most popular, products for displaying your portraits and helping you treasure them for years to come. Quality, timelessness and beauty are all important to us when choosing what products we offer our clients. Only the best, most luxurious products are good enough to hold and display your beautiful family portraits. Our fine art cotton rag prints are where the magic begins. There is something beautiful about holding a beautiful portrait in your hand. Creating heirloom quality products for you to display in your home for years to come is central to what we do. Fine Art prints are printed on a specially designed printer that has been carefully calibrated and colour managed. The process produces stunningly detailed prints that will last well over 100 years with proper care. Prints from a professional lab with the highest of standards are worthy of being in an art gallery and worth of the words ‘fine art’ and this is what your family portraits deserve to be printed on. These prints are of the highest quality available. We have worked tirelessly with our professional printing lab to fine tune the colour gamut and tonal range of our prints on this beautiful smooth cotton paper. The detail and colour is unmatched. 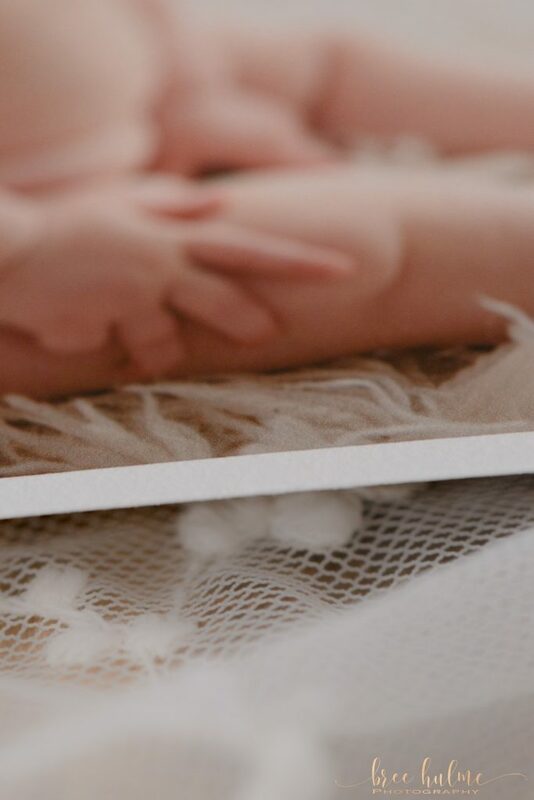 These prints are delicate and as precious as your beautiful children and if you are rough with them the ink will be damaged. Our fine art prints come matted, and can be framed at your request. Our most popular framing option is a simple yet beautiful white Italian hardwood moulding. This style emphasises clean lines and a sleek, modern design transporting your wall art into an instant classic piece of art. Displayed individually on a wall or grouped together to form a story board these framed artworks are the perfect central showpiece for your home. 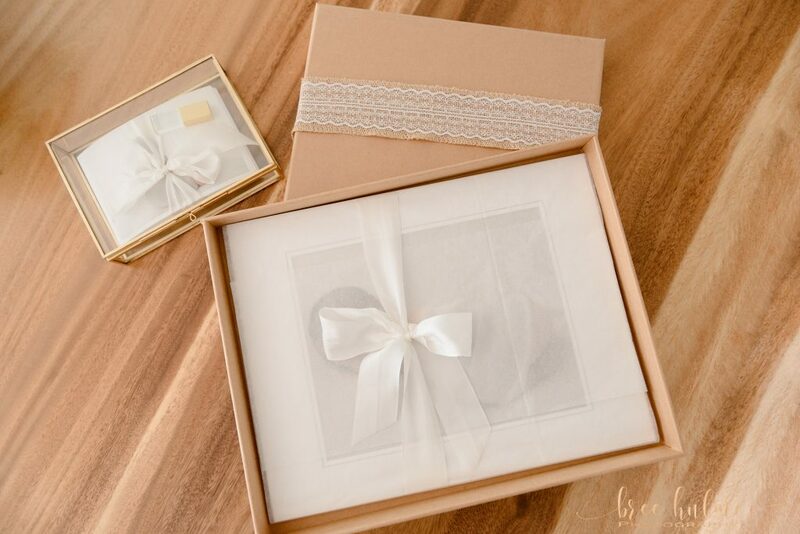 For an added handmade touch we also offer beautiful papers for framing that come with a hand-torn, deckled edge finish. 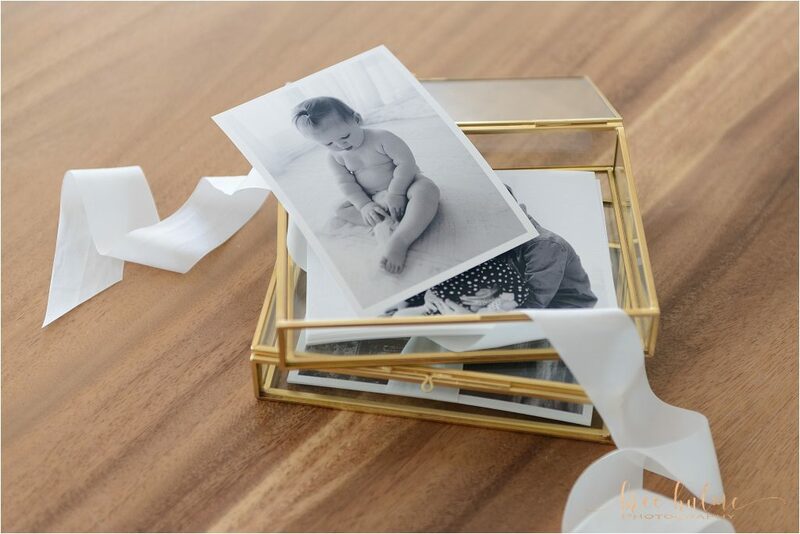 There’s nothing like an album for carefully storing your family portraits in the one place. 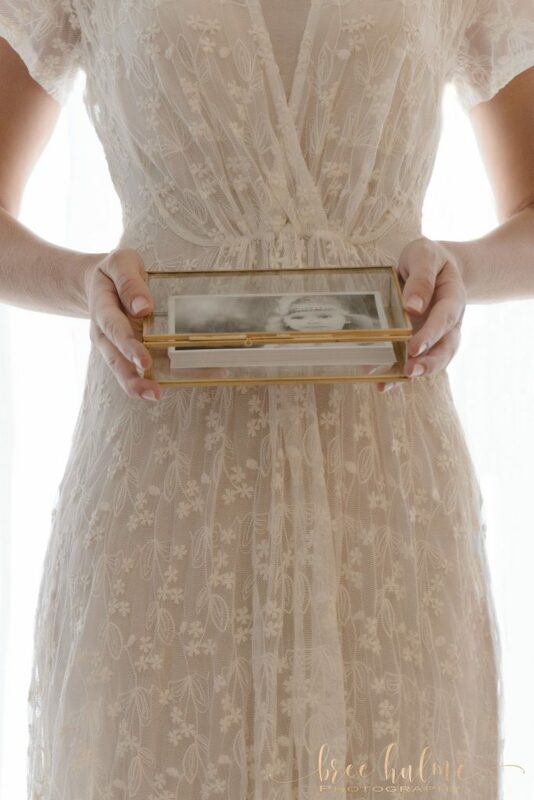 We have sourced artisan crafted heirloom albums to display your treasured keepsakes. 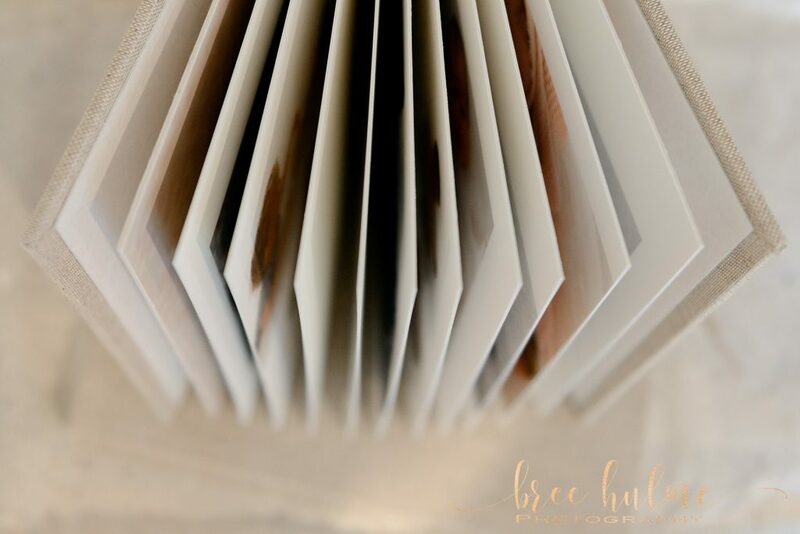 Our gorgeous handmade heirloom albums are all printed on fine art, archival paper giving you the beauty of our fine art prints bound up in a modern and elegant album design. 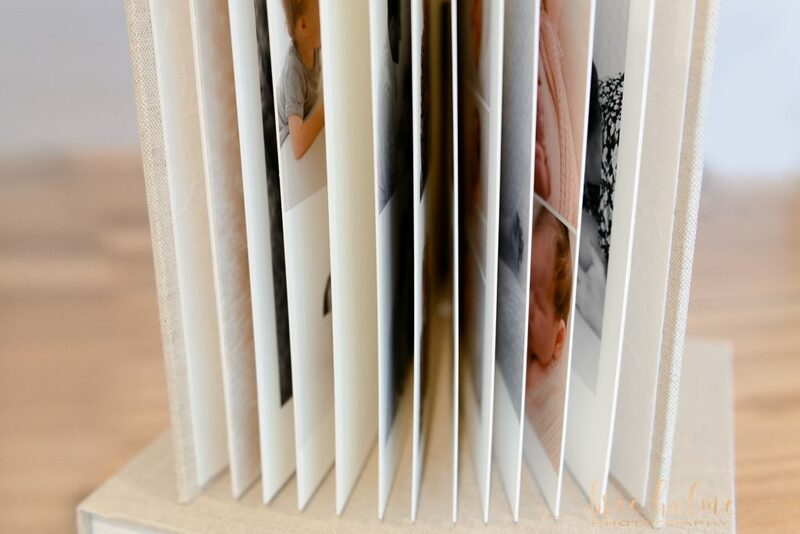 Our album spreads are creased down the centre of the page ensuring a layflat design that provides an uninterupted view of each album spread and your beautiful portraits. Each page is luxurious and ready to be loved and poured over for generations. Pages are thick (approx 1mm) and our album comes standard with 10 double page spreads but can hold up to 45 double page spreads. Each album is bound in natural fibre linen for a rich luxe feel, and features beautiful handmade Nepalese paper lining inside the front and back cover. 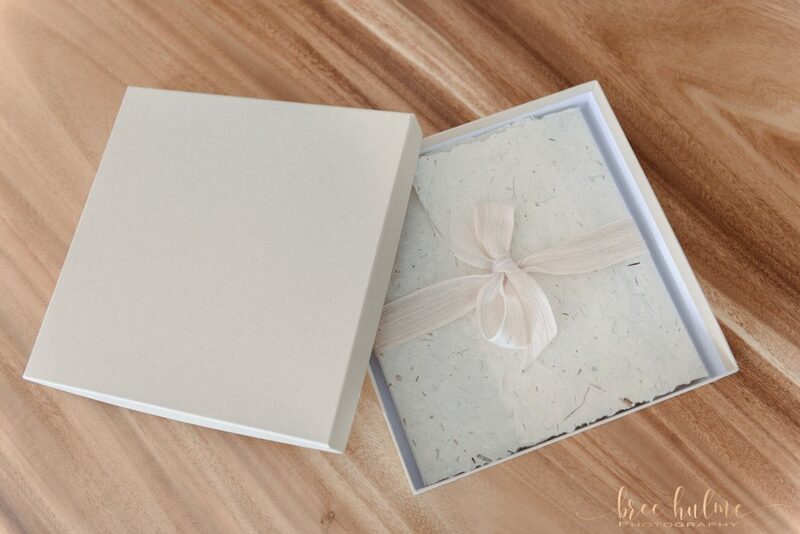 Our albums are elegantly packaged inside a durable display box for safe keeping and wrapped in our beautiful handmade paper and tied with a bow. 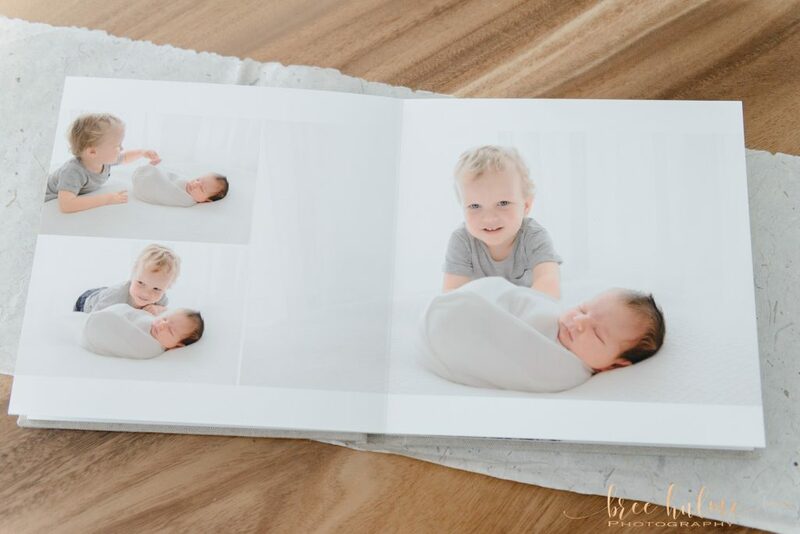 Our heirloom albums are 10 x 10 inches and can hold up to approximately 30 images depending on the final layout of your album for our standard 10 double page spread album. The best part, is that we lay out the album design for you, collaborating together to include all of your favourite images and ensuring a design that you fall in love with. 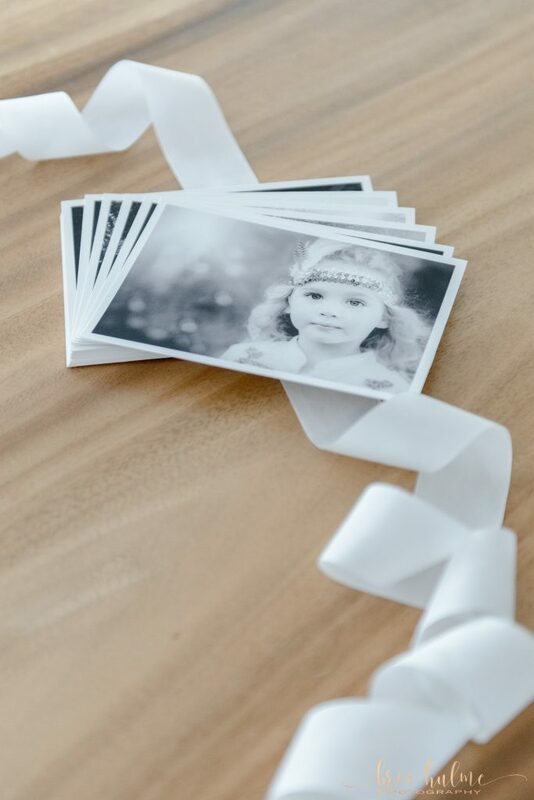 To make this process even easier it can be done at our studio or online using our album proofing software, which is simple and quick to use, allowing you to review the layouts, make comments and request changes effortlessly. Today is a digital age and we understand that for many of our clients purchasing the digital files from your gallery is important. But sending through a dropbox link or even handing over a USB doesn’t quite feel as magical as the beautiful portraits we have created for you. We want your purchase of digital portraits to feel as special as when we hand over an album or a collection of stunning fine art prints. 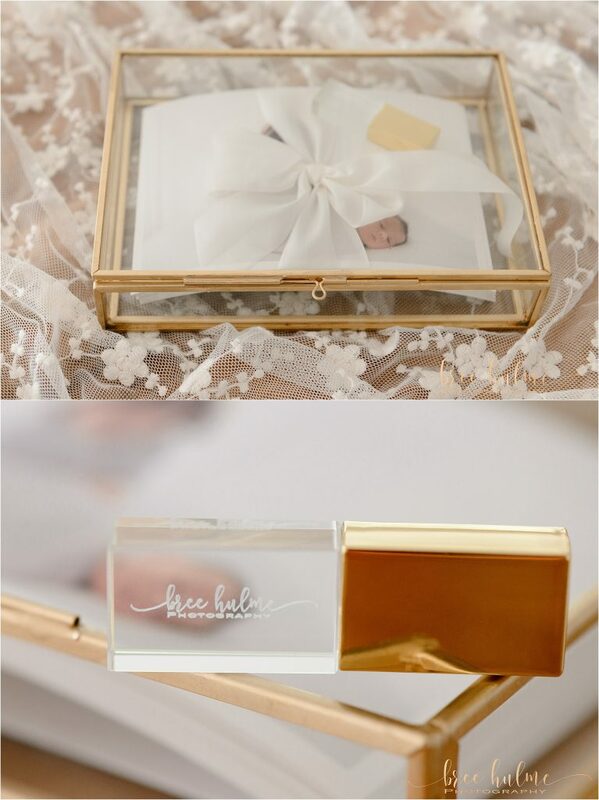 With this in mind we have created this beautiful digital collection keepsake box for just this reason. 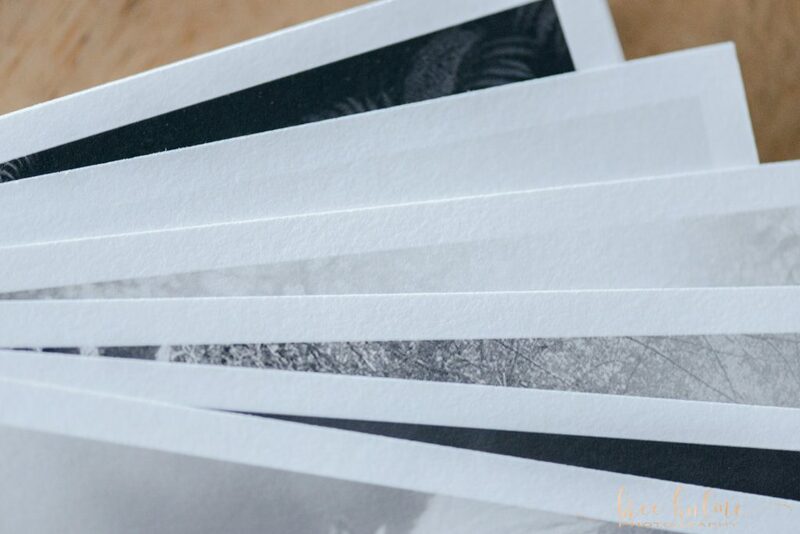 Every digital you purchase from Bree Hulme Photography comes with a complimentary small 4 x 6 inch fine art print. Although these beautiful prints are small they deserve a beautiful home, an elegant way to be on display for years to come. 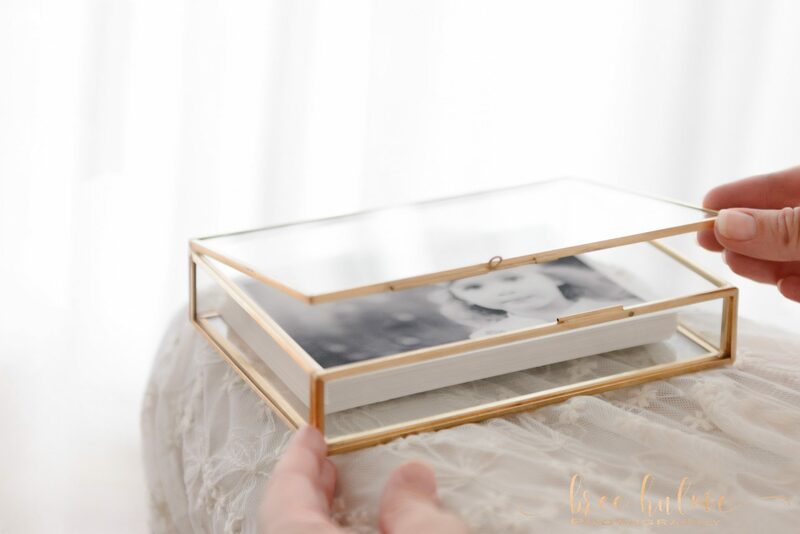 This elegant hand made vintage glass box perfectly displays your stunning prints and holds your glass USB inside. 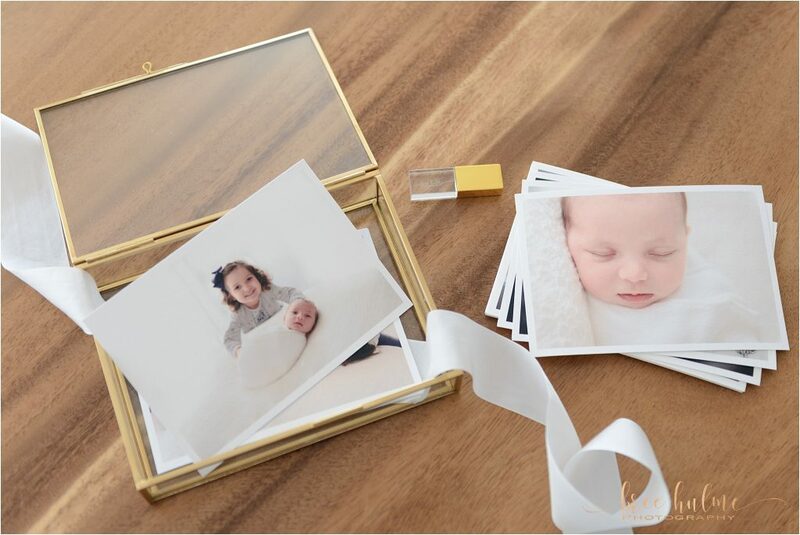 Now your digital purchases feel as special as your large prints and albums holding your beautiful family portraits. 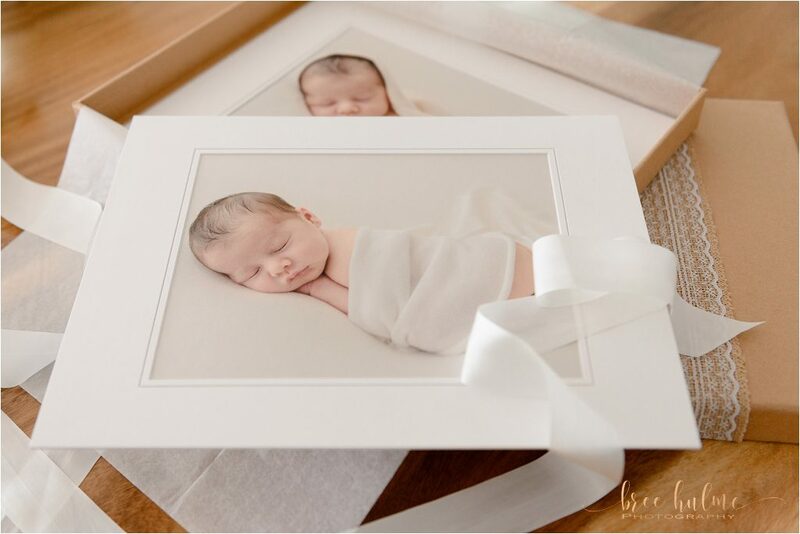 Of course, these are just a sample of the many beautiful products we love at Bree Hulme Photography. We have lots more on offer. Our products are all sourced from professional printing labs who specialise in beautiful professional portrait printing. Talk with us about how you would love to have your beautiful portraits displayed in your home and we will help you create the perfect pieces of art.